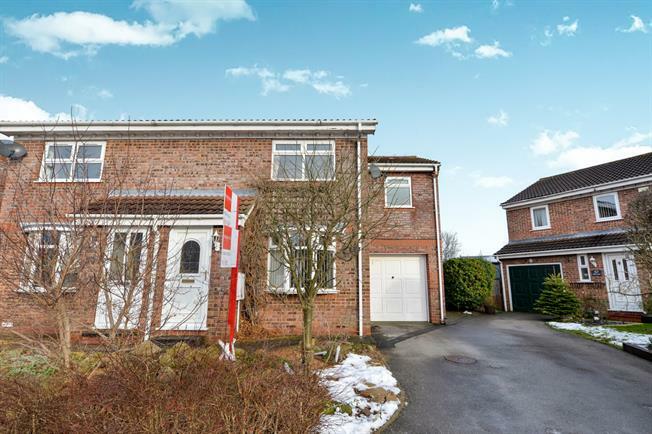 4 Bedroom Semi Detached House For Sale in Northallerton for Offers Over £180,000. A deceptively spacious four bedroom semi detached property that has had a double extension and is offered to the market with no onward chain. In brief the property comprises of entrance hallway, living room, kitchen, dining room, utility and cloakroom to the ground floor and four good sized bedrooms and a family bathroom to the first floor. The property is situated on a good sized plot with driveway and integral garage allowing ample off street parking and front and rear gardens which are mainly laid to lawn. Double glazed door leads to hallway and giving access to ground floor rooms. Double glazed bay window facing the front. Radiator and electric fire. Double glazed window facing the rear. Granite effect work surface, inset sink, range oven, gas hob, over hob extractor. Side double glazed door, opening onto the garden. Double glazed window facing the rear. Radiator. With window to rear aspect and radiator. Radiator. Low level WC, vanity unit and inset sink. Double glazed window facing the front. Radiator, sliding door wardrobe. Good sized bathroom with corner bath, shower and cubicle, low level W.C and pedestal hand wash basin. Double garage with power and lighting and also fitting newly installed boiler.